What is a Primavera software? Oracle Primavera P6 (referred to as P6 for the rest of this chapter) is such an integrated system. As of version 8, Oracle has embedded in P6 a number of other systems. Each of those can be implemented separately and will work as a standalone solution, but when used together they will behave as a single integrated system. The core of P6 is its scheduling engine. 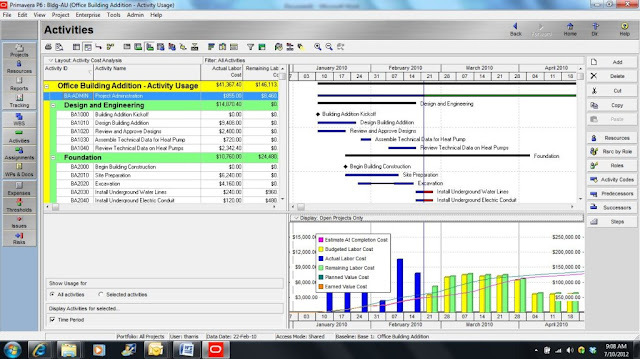 This is based on the planning tools developed by Primavera Systems since 1983. The scheduling engine uses the critical path method of scheduling to calculate dates and total float. While incorporating advanced scheduling functions, Primavera made sure each of these functions remained simple enough so that the main skills required to properly analyse project information relate to project management rather than the software. The default reporting in P6 is based on the WBS. Summarisation at all levels of the WBS is automatic, and managers can easily access this information to the level that is relevant to them. However, cost, resource usage, and day-to-day organisation of the work on the project sometimes require to view the project from different angles. For this, P6 lets users define as many coding structures as they like, at project, resource, or activity level. These codes can be hierarchical or flat. With simple ways to summarise, group, and filter activities, this allows building views of the project plan relevant to any actor of the project. This goes from a client view relating to the contract all the way down to a resource-specific view by system, location, or any other relevant way to organise the information.These views can be saved to access them more easily in the future, and they can be shared with any other user of the system. The same principles apply at all levels of the system, so that a user fluent with detailed activity level views can also build portfolio or resource assignment level ones. P6 offers a resource pool shared between the projects to make it possible to analyse resource requirements at any level from a single WBS element to a complete portfolio of projects, or even for the company as a whole. P6 allows to model resources as labour, equipment, facilities, and material. Once described in the dictionary, resources can be assigned to activities in the project. Once the activities have been scheduled, this provides profiles of resource requirements. Resources can be assigned unit prices, should the company decide to model costs on the schedule based on usage of the resources modelled. Costs can also be modelled as expense items, which are direct cost assignments that do not require resources to be created in the dictionary. Expense items can relate to vendors, cost category, cost account, or any other analysis angle deemed desirable for analysis or reporting. Should there be a need to identify resources more precisely than they are known at the time the baseline is taken (e.g., analysis of named individual time is required, but only the skills needed are known at the time the baseline is taken), P6 also allows resourcing of activities by role. This allows the user to book a budget on the schedule without knowing exactly which resource is going to do the job. P6 can save any number of versions of a schedule to be used as references and compared to the current schedule when required. This can include the baseline, any re-baseline following a change order, any periodic copy of the schedule, or what-if analysis versions of the schedule that someone may want to compare with the current schedule. Each reference plan contains a full copy of all the information contained in the schedule. It is therefore possible to compare schedule information – such as dates, duration, and float – resource information – such as requirements or actual usage – and cost information – such as budget, earned value, or actual cost. Baselines can also be updated by copying a selected subset of the current project information into an existing baseline. This makes it much easier to adjust the content of the baseline to the current scope without affecting in the baseline the part of the project that was not affected by change management. As any number of reference plans can be maintained, this enables earned value analysis against the original baseline, or against a current baseline reflecting the current scope of the project. for all based on the level of detail that can be gathered. mapped on the baseline in the form of a progress line. labour unit percent complete, material cost percent complete, or cost percent of budget. duration, dates, units of resources by type, or costs. the use of the WBS or any coding. index, schedule performance index, as well as cost, schedule, and at completion variances. and schedule performance index to date in the calculation of the estimate to complete. ranges can be defined to reflect the important factors for a specific company. The system allows the definition of as many impacts categories as needed, to help reflect quantifiable impacts such as schedule and costs, as well as other impacts such as image, health and safety, or environment. Once qualified with levels or probability and impacts, P6 will rate the risk based on a configurable risk rating matrix. The overall rating of a risk can combine the impact ratings in different ways, by selecting the highest one, the average of the impacts, or the average of the impact ratings. Running a Monte Carlo analysis on a schedule requires Primavera Risk Analysis. It is possible to store three-point estimates in the P6 schedule though so the uncertainty can be maintained within the main schedule. Even though schedules are split in projects in the database, P6 handles multiple projects as if they were just subsets of activities, part of the same total group. This means that reporting makes no difference between single and multi-project content, but also that scheduling can be done across all the projects. Even when opening only one of a group of inter-dependent projects, the user has a choice between taking into account inter-dependencies or not during the scheduling calculations. Similarly, one can analyse resource utilisation based on only the schedule he is working with, or include requirements from other projects. If needed, projects can be prioritised so as to only consider projects of a high enough priority in the resource analysis. There are two main ways to access P6: through the Web, or by using the optional Windows client. The later requires a high bandwidth between the client and the database server, or the use of virtualisation technology such as Citrix or Terminal Services. It is a powerful tool, but the high number of functions available makes it feel complex for users who do not have much time to learn it. This makes it a specialist tool, perfect for planners or Central Project Office people, but less appealing to people who only have limited interactions with planning. The Web access of P6 lets users connect to the P6 database through a Web browser-based application. It is both simpler and more complete. It is simpler in that when looking at a specific function, the interface isn’t quite as busy as the Windows client. Yet it is more complete in that it provides views and functions that are geared toward the different roles participants of the project may play in the project. From the resource assigned to a few tasks on a project to a company director interested only in traffic light type reporting on cost and schedule for each project, P6 Web can display relevant information to each person involved based on their involvement. Resources can see the tasks they are assigned to, including detailed information about those tasks, and documents that may be attached to the tasks to help complete them. Planners can see the schedule, with similar functionality to what the optional Windows client provides. Project managers can see high-level reporting and analysis on the schedule, costs, and resources, with drill-down capability to find where the problem is. Resource managers can view how busy their team is across all the projects in the company, as well as details of what each individual is working on. Executives and directors can have portfolio or programme level traffic light type reporting, with a high-level schedule, cost, resource, or earned value figure summarised at any level that makes sense to them. For each role identified, the administrator can provide a dashboard that will contain easy access to each report and function needed for that role. The content of those reports and function portlets will be based on the individual, the activities he is assigned to, the projects he is in charge of, or the portfolios that are relevant to that user. As users could have several roles, they can subscribe to several dashboards. Most of the reporting out of Oracle Primavera P6 is based on viewing or printing on-screen layouts. In agreement with the role-based access described above, P6 offers many ways to present and aggregate the project information based on the person accessing this information. These ways of viewing project information are usually enough for most people. However, should people prefer to get reports delivered in other formats, it is possible to use Oracle BI Publisher, which comes bundled with P6 licenses.